With the 2019 program, Supercharged, campers will take on four exciting challenges. In Innovation Force, the children will collaborate with inventor superheroes and take on the role of engineers, fabricators, and innovators to conquer villains. Creative problem solving is the focus of Deep Sea Mystery, where campers team up to rebuild ships and design underwater equipment. 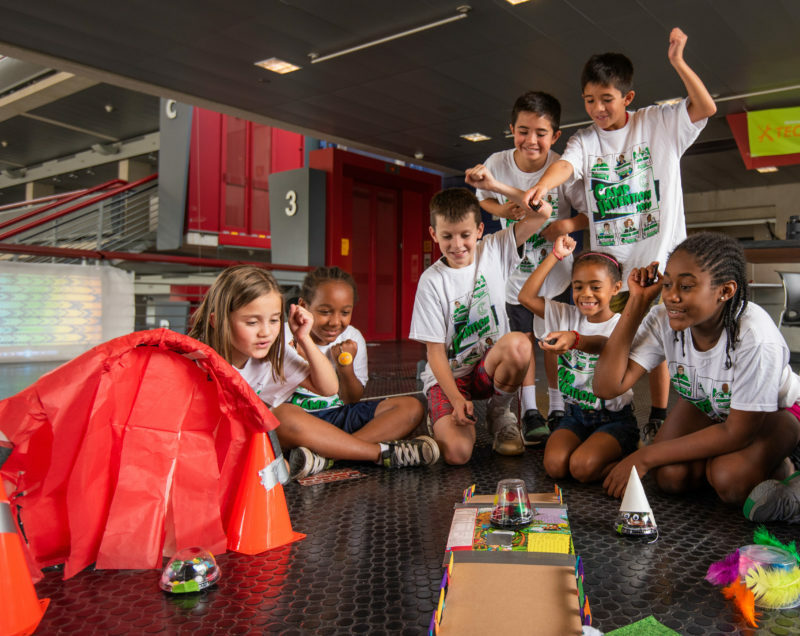 In DIY Orbot, participants explore circuit boards, motors, and gears as they design a remote-control bot to take on obstacles from sports to dance. And kids will gain confidence in Farm Tech as they code bots to turn a polluted wasteland into a money-making machine and create devices to save animals. Photo courtesy of Camp Riverbend. Founded in 1962 by Marianne and Harold Breene, Camp Riverbend sits on a 30-acre site along the Passaic River in Somerset County. The four Breene children — Roger, Jill, Paul, and Robin, and daughters-in-law Debbie and Miriam — now run the camp, and each member of the family is dedicated to providing a personal, hands-on experience that campers will never forget. Camp Riverbend provides a wide range of activities, including arts and crafts, sports, swimming, challenge courses, a spray park, environmental learning, and performing arts. Camp-wide special events like carnivals and guest performances are enjoyed by campers and staff alike. Camp Riverbend offers three options for children of different ages: The Clubhouse for Pre-K 3- and 4-year-olds and rising kindergarteners; Riverbend Experience for campers entering first through eighth grade; and Day Trippers for campers entering grades seven through nine. 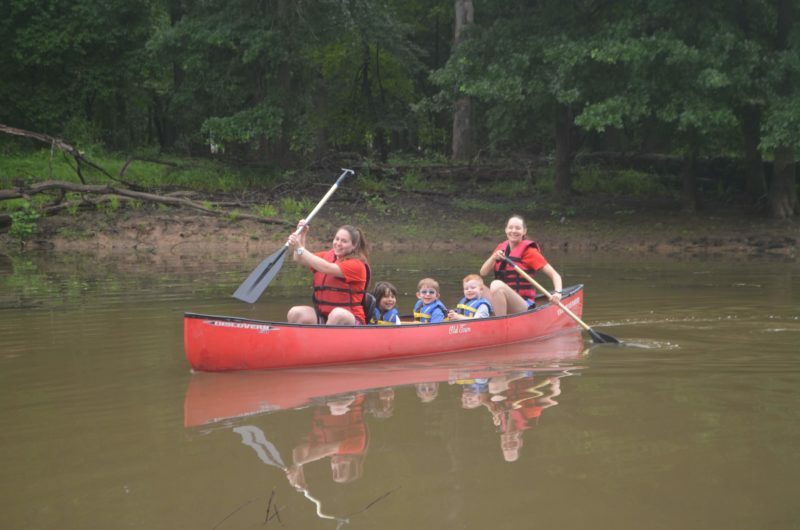 Camp Riverbend provides the perfect environment for young explorers, with vibrant woods, open fields, nature trails, a wetlands sanctuary, a variety of athletic facilities, and the river bank. 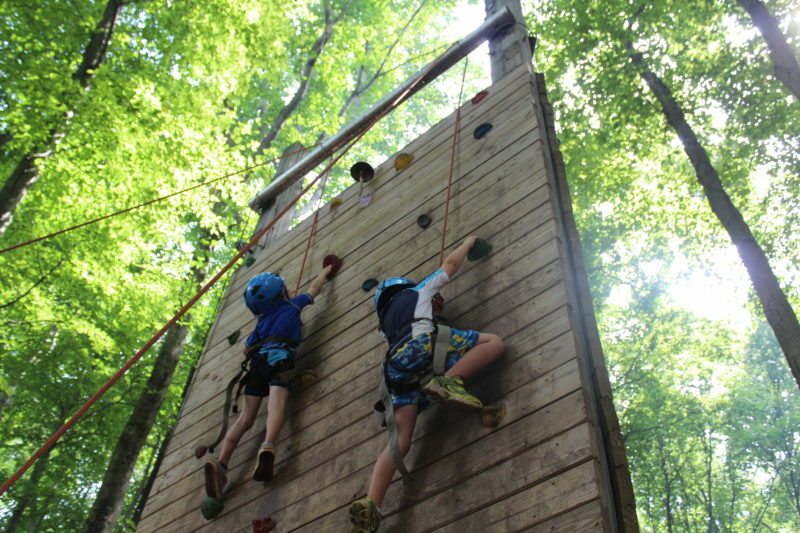 The philosophy at Camp Riverbend is to build “confidence, not competition.” The camp honors each camper’s talents and efforts, emphasizing that it is a place where children can be themselves, explore the world, and learn new skills in a fun and supportive environment. Every camper is encouraged to participate in all activities and every achievement is applauded — from a camper’s first at-bat to a grand-slam home run. Photo courtesy of Somerset County Park Commission. 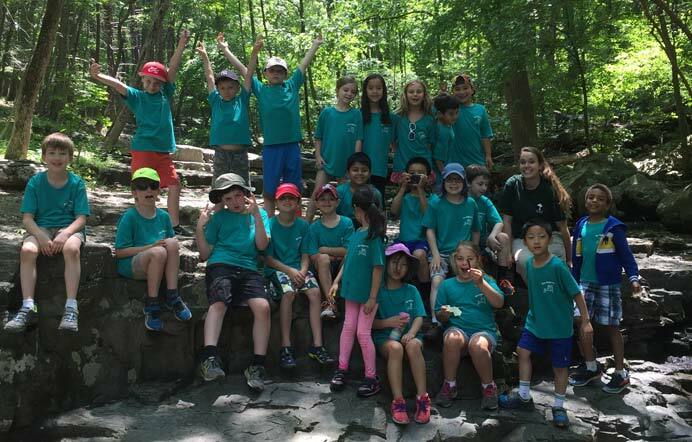 The Somerset County Park Commission has offered enriching and fun summer camp programs to area children for more than 20 years. They aim to inspire a lifelong love and respect for the natural world, while also cultivating a curiosity about the environment and a fondness for science. Outdoor lessons and hands-on experiences are just some of the benefits of the summer programs. With nearly 500 acres of fields, forests, ponds, and a river, the Environmental Education Center at Lord Stirling Park offers unique opportunities in a natural learning environment. Coyote Kids (ages 4-6) will be offered in three, five-day sessions. Eco-Explorers (ages 7-9) will be offering four, one-week sessions and two, two-week sessions. AWESIM KIDS (ages 10-13) will be offering four, two-week sessions. Xtreme Adventure (ages 13-16) will also be returning for another summer of adventure. Post-care for both the Eco-Explorers and AWESIM KIDS programs are available each session for an additional fee. Post-care extends the program day from 4:30 to 5:30 p.m.
Photo courtesy of Turtle Back Zoo. Located in West Orange, the Turtle Back Zoo is committed to providing an enriching recreational experience that fosters excellence in wildlife education and wildlife conservation, so that present and future generations are inspired to understand, appreciate, and protect the fragile interdependence of all living things. Turtle Back Zoo offers a variety of education programs, including week-long summer camps running July 8 through August 23 for children age 5/entering kindergarten and grades one through eight. 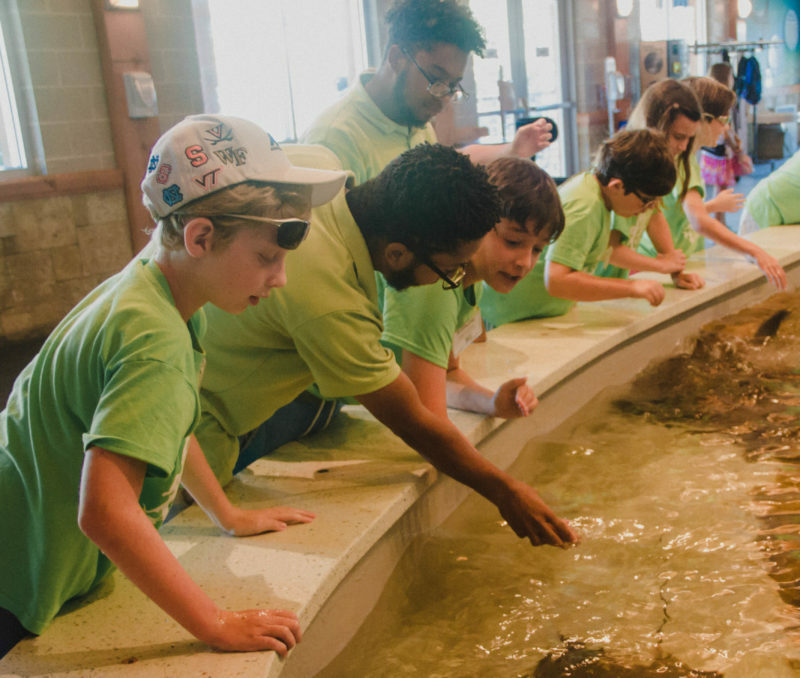 Campers will be introduced to the world of animals, nature, and science, and enjoy age-appropriate themed camps that include games, teacher-led sessions, behind-the-scenes visits, up-close animal encounters, hands-on science, and fun crafts. Themes for 2019 include Zoo Tales, for campers age 5 and entering kindergarten, featuring stories, experiments, games, and crafts that will make them experts on all the “wild things” at the zoo. In Super Animals, children entering first or second grade can explore the assortment of fascinating adaptations that help animals survive in their habitats. Children entering third or fourth grade can discover the complex world of animals as expert engineers and builders in Wild Designs. In Conservation Quest, for children entering fifth or sixth grade, campers will examine the world of conservation, locally and beyond. In Zoo Crew, for children entering seventh or eighth grades, campers will learn all about being a zoo keeper, from feeding the animals and creating enrichment activities, to building habitats. Photo courtesy of Harbor Haven. Harbor Haven offers comprehensive summer programming for children with mild special needs. Its unique seven-week summer camp program provides children ages 3 to 15 with a social and educational experience that bridges the gap between school years. In a nurturing, camp-like environment, children engage in a variety of traditional summer activities combined with strong support for the academic, therapeutic, and social needs described in their Individualized Education Plan (IEP). Harbor Haven is committed to providing its campers with a safe, happy, healthy, fun-filled summer where growth and improvement of important skills takes place. Through a variety of nurturing programs, in a relaxed and supportive environment, they build “success” into the everyday experience, thereby increasing confidence and self-esteem. Activities include sports, creative arts, performing arts, swim, yoga, karate, photography, cooking, trips, special events, and more. Harbor Haven’s innovative and effective Reverse Inclusion experience invites non-IEP peers into its camper groups. This program provides the opportunity for the special needs campers to experience friendship, activities, and interaction with similar-aged role models who have been carefully chosen to enhance their summer learning. The special needs campers will derive all the benefits and none of the difficulties that can occur in other inclusive settings not designed especially for them. The camp’s focus on language, motor, attention, cognitive, social, and behavior skills is infused in all of their activities. Harbor Haven believes that the capacity to socialize with other children is fundamental for healthy growth and development. Their program, imbedded with intensive social skills, also includes an instructional social skills program which prepares children to be successful in the world around them. Photo courtesy of Basking Ridge Country Club. Is your child interested in learning more about golf? 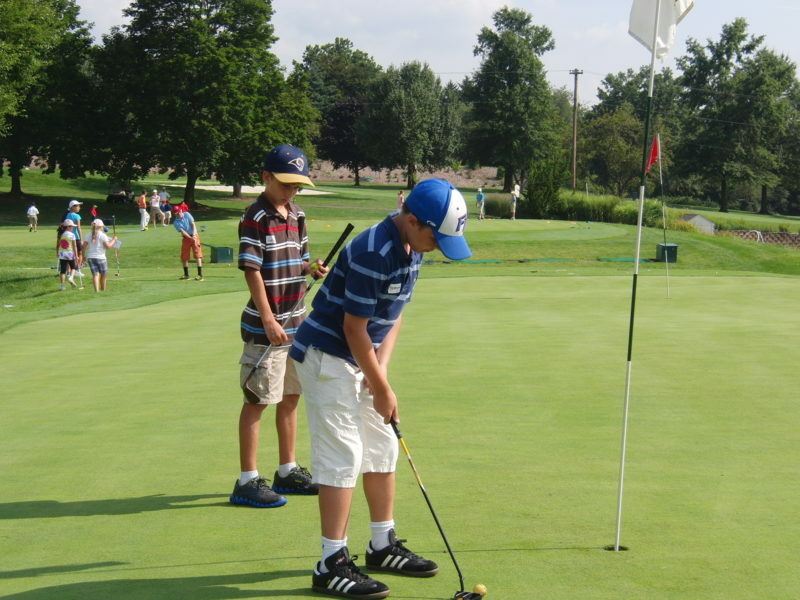 The knowledge and skills learned at Basking Ridge Country Club’s Junior Summer Camp can leave a young golfer full of confidence and well on their way to a lifelong enjoyment of the game. Friends with similar goals, professional instructors, and the completely immersive setting provide opportunities to learn while having fun. The PGA professionals at Basking Ridge Golf Academy are dedicated to helping young golfers become better players. 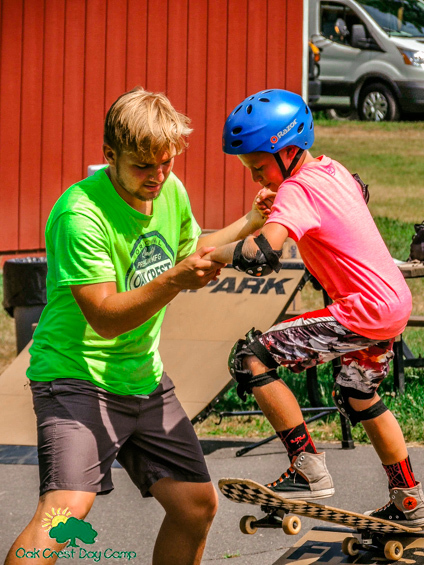 With a maximum of seven campers assigned to each professional, the classes allow time for individual instruction along with beneficial group interaction. Campers ages 7-16 are sorted according to age and ability, so everyone can experience success. Half-day camps offer a complete rundown of the golf swing. Mechanics are explained, and young golfers spend time practicing fundamental movement drills. Golf pros assist with putting, chipping, full swing, and specialty shot skills, and campers are shown how and when to use them on the course. In addition to providing the full swing instruction of half-day camps, the full-day programs supply details on golf as a sport and a business. Young golfers learn the game’s rules and etiquette as well as the history and stories of today’s players. Instructors explain how to read greens, choose a club, and improve short games. Video analysis is used to help beginning golfers understand their swing. Full-day sessions typically include a warmup, lessons, and drills in the morning. After lunch, there’s time for a swim, and then game play begins with course instruction along the way. Golf membership is not required to participate in the camp. Four camp sessions are offered this summer, the first starting on June 24. Register early, as sessions fill up fast. For more than 50 years, the mission of Oak Crest Day Camp has been to create a summer experience so exceptional that it makes campers for life. Its core philosophy is to ensure that every camper experiences growth and success in a fun-filled, safe, and well-supervised environment. Programs are offered for children ages 3-15, with each program designed to meet the physical and developmental needs of that specific age group. All programs include a hot lunch, door-to-door transportation, and instructional swim lessons. Campers arrive at Oak Crest between 8:30 a.m. and 8:45 a.m., and leave at 4:10 p.m. daily. The camp offers a five full-day program for all campers, as well as a three full-day and five half-day options for campers ages 3-5. Programs include Munchkins (ages 3-5), Explorers (first and second graders), Juniors (third and fourth graders), Seniors (fifth and sixth graders), Teen Travel (seventh, eighth, and ninth graders), and LIT (10th and 11th graders). At Oak Crest, professionally trained counselors and specialists are carefully hired, screened, and taught to help children find their own avenue of success at camp. This comes in many forms, from the soccer field to the climbing tower, in the ceramics studio, and on the stage in the camp show, where children will learn real skills and leave camp feeling accomplished. In addition to the skills taught in the activities, campers will learn the social and emotional skills that come with working as a group, which are often missing in today’s world of virtual interactions. This summer’s sessions run June 27 through August 23. Before- and after-care programs are also available. Photo courtesy of Pioneer Trails Day Camp. 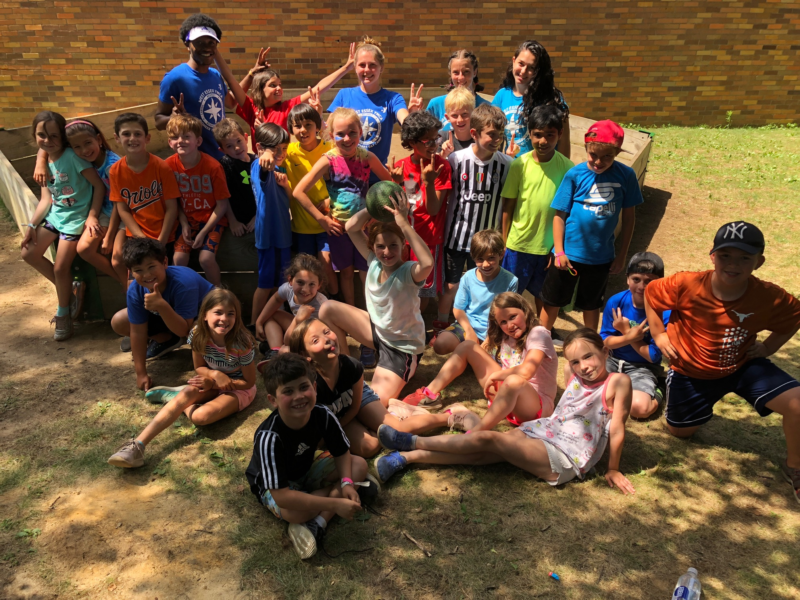 Operated by the West Essex YMCA and held at Caldwell University, Pioneer Trails Day Camp offers campers an opportunity to discover new interests and gain a sense of achievement through progressive, age-appropriate activities and experiences. Teamwork, problem solving, curiosity, self-confidence, and the Y values of caring, respect, honesty, and responsibility are emphasized throughout the camp program. Pre-K through eighth grade campers, grouped together by the grade that they will enter in September, will follow a daily schedule packed with specialty activities that take them from the Flag Salute at morning line-up to the end of the camp day. Each week of camp has a special theme along with corresponding activities for the week. The camp’s specialists provide age-appropriate instruction in arts and crafts, archery, performing arts, STEAM (Science, Technology, Engineering, Art, and Math), indoor and outdoor sports, tennis, computers and group swim lessons. Every week of camp also includes a special event such as an on-site educational or instructive program or a field trip. Previous special events include Corey the Dribbler, the Frisbee Guy, Circus Workshops, and field trips to Sky Zone, Jumpnasium, and Lewis Morris State Park. This year’s camp dates are June 24 to August 9. Photo courtesy of Tamarack Day Camp. Tamarack Day Camp is a co-ed camp for children ages 3-15 that prides itself on creating amazing summer experiences that its campers will remember for a lifetime. Guided by its mission, Tamarack provides a unique atmosphere which allows campers to develop skills in a variety of activities while gaining life skills such as independence, confidence, and leadership skills. Through the activities, the staff help campers develop their emotional intelligence, and learn to set and achieve goals, building perseverance and resiliency. At Tamarack, the programs are designed to meet the physical and developmental needs of each age group. Tamarack’s beautiful 37-acre facility located in the heart of Randolph features plenty of field space, a new state-of-the art heated Olympic size pool, a pro-turf sports complex, air-conditioned creative arts studio, skate park, ropes course, and two zip lines. The camp experience also includes door-to-door transportation and a full lunch program. Tamarack offers four through eight week sessions. Camp begins on June 27.